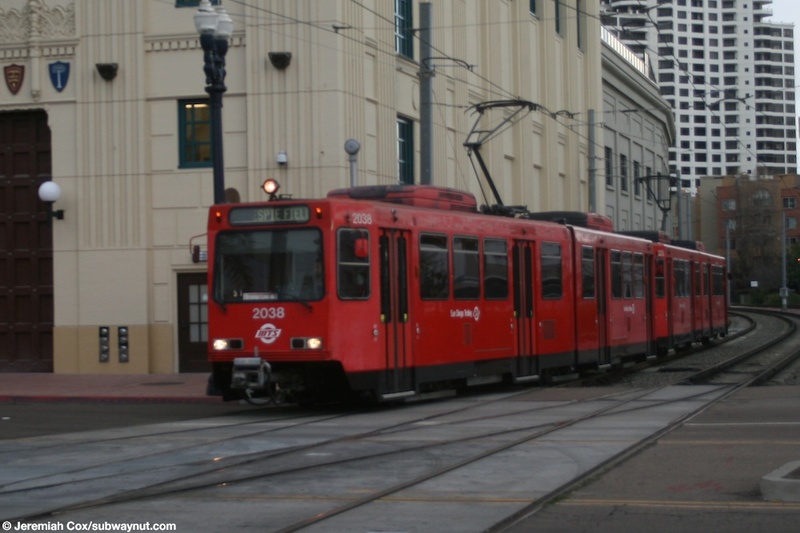 Local train service to the depot was restored as the northern terminus of the opening day route of the San Diego Trolley on July 19, 1981. 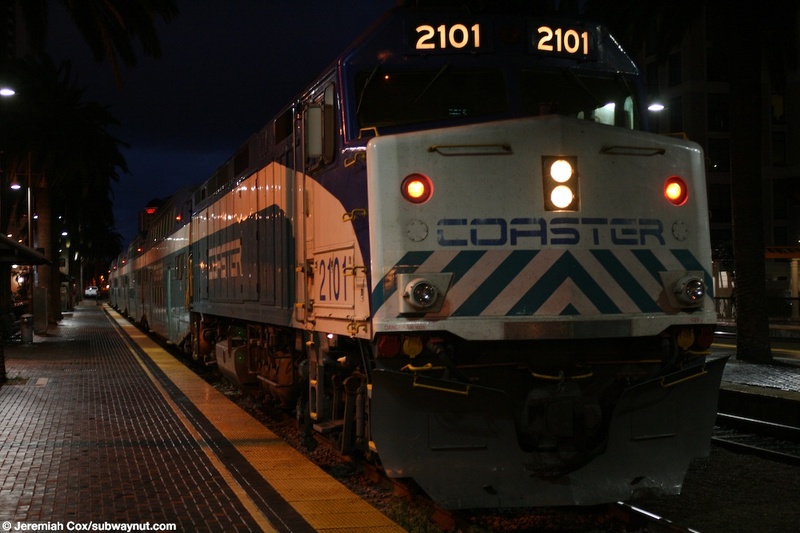 Modern-day Commuter Rail service north to Oceanside via the Coaster began on February 27, 1995 and today it runs daily including a few trains with connections to Metrolink in Oceanside allowing passengers to take Commuter Trains all the way to Los Angeles (as of July 2012 fares) costing $5.50 plus $15, $20.50 instead of the standard $36.00 for Amtrak. 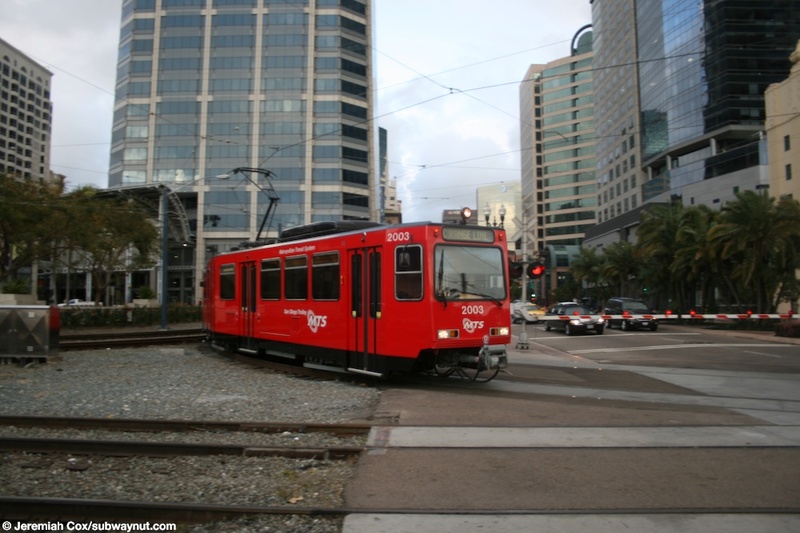 On September 2, 2012 Trolley service was completely reconfigured with the Green Line extended south form Old Town Transit Center to 12th/Imperial via the Waterfront route replacing the northern portion of the Blue Line and end of the Orange Line. 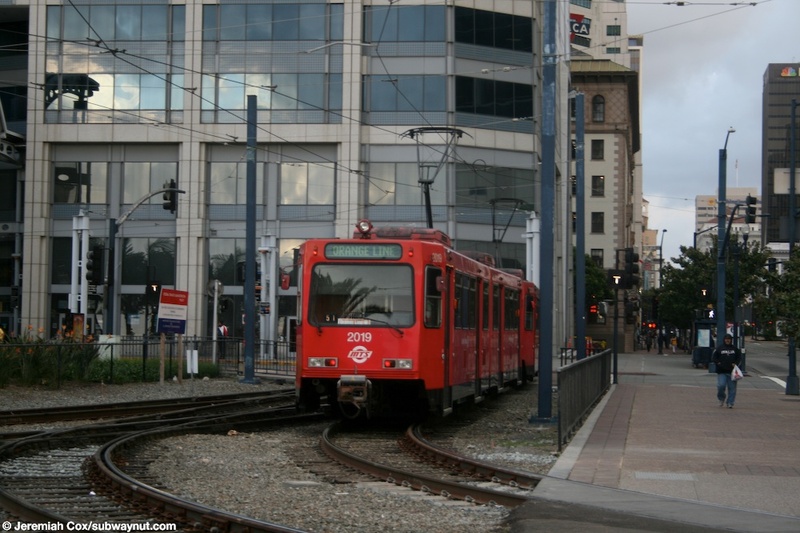 Now Orange Line trains terminate at Santa Fe Depot on the southbound track (shared with Southbound Green Line trains) only while Blue Line service terminates a block away (and accross Kettner Blvd from the depot) at America Plaza. The tour of the station begins inside the mission-revival style depot which rests between Kettner Blvd and train tracks. The Station is one of the few where Amtrak passengers are led across light rail tracks at a grade to board their trains from the station's depot. 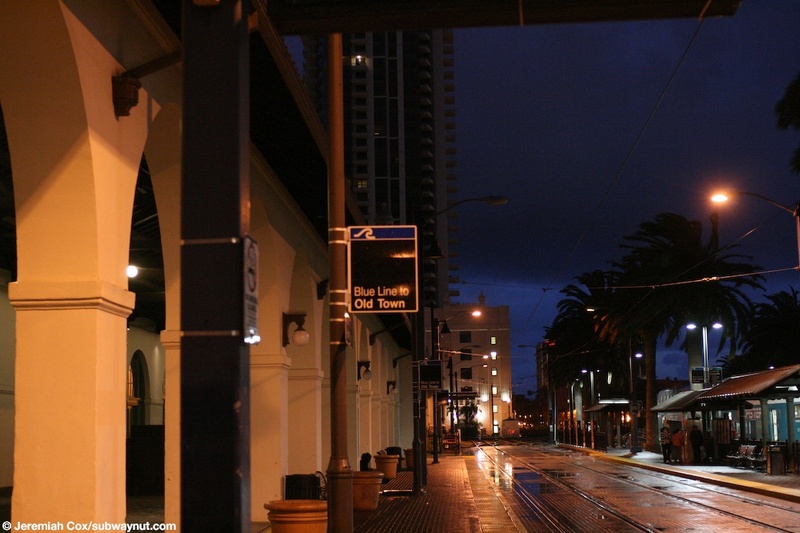 The only other stations are San Diego-Old Town and Dallas's Union Station, although both of these also have usable underpasses. 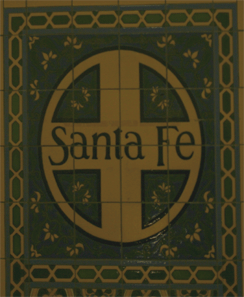 Inside the depot are arched ceilings along with historic benches and light fixtures and mosaics of the Santa Fe's iconic cross logo. There are wooden benches for waiting passengers along with an Amtrak ticket window (beneath 1970s Helvetica-text reading tickets), an information kiosk and a small cafe/newsstand called the Silver Streak Cafe. 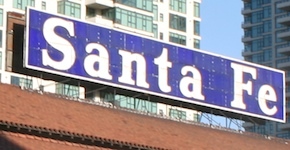 There is still a blue Santa Fe sign on the top of the depot, and the southern end leads to an outdoor area with a fountain and there are two taller towers with domes at this main entrance. The white walls above the doors still read Waiting Room and Ticket Office above Green and glass doors. Going out platform side, first are the two light rail tracks used by the Blue Line (soon to switch to the Orange and Green Lines). These have side platforms. The northbound platform has no canopies of its own but just large exterior arched porches that radiate from the station abut this track. It is in a central area beneath these arches that Amtrak does its line-ups for the kindergarden walks across the trolley tracks to its trains The southbound platform is shared with the first mainline train track normally used by the Coaster, there are four tracks for Amtrak and Coaster in total. This platform has TVMs facing different directions for the two different systems and even different Compass Card Readers. A fence with gaps runs down the middle of it separating the two sides and it has a line of iconic palm trees. At the northern and southern ends of this long platform, beyond the length for trolley cars, the fence runs directly alongside the trolley tracks as it extends all the way from Broadway to Ash street, almost a third of a mile long, running alongside switches from the middle two train tracks. There three simple grey canopy structures for waiting passengers. The middle mainline platform is significantly shorter and its only legal access is from the three pedestrian grade crossings that connect all the platforms. This platform has 4 small canopies along it. The final track is served by its own side platform which also reaches the full length from Broadway to Ash Street. It though has an unusual canopy structure of a colonnade holding up a wooden truss roof (that does nothing for protection from the elements), designed for ivy to grow up over it. The ivy has already made some progress up the columns. 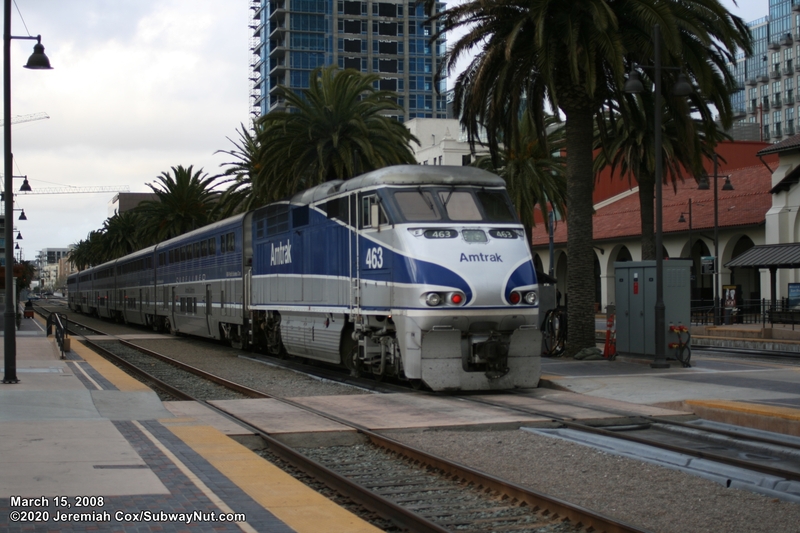 All main line platforms have mini-high platform at its southern end for Coaster trains, have tactile warning strip on their edges, and allow for level boarding to the doors of all Double-decker Amtrak Surfliner Cars and Bombardier Bi-Level Cars used by the Coaster. 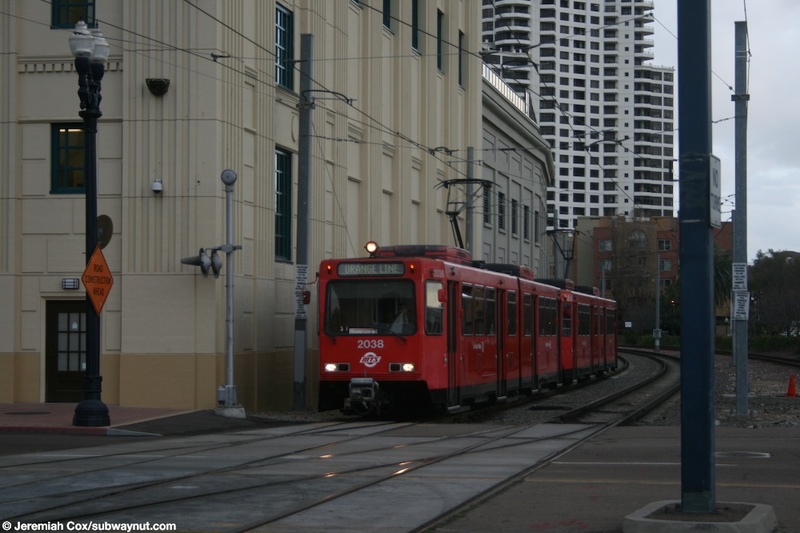 SD100 LRV #2003 leads an orange line train (that doesn't actually stop at the Santa Fe Depot, but goes around it). 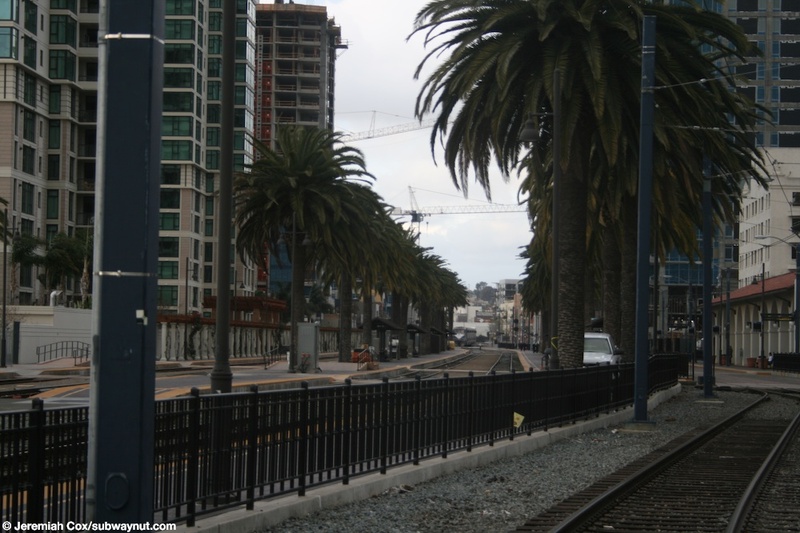 As it curves out of the America Plaza Station that is only one block away from the Santa Fe Depot Station. 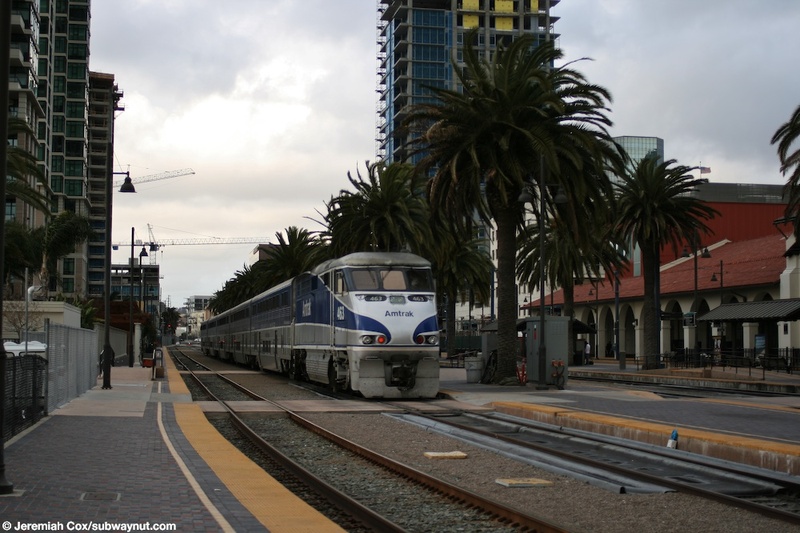 SD100 LRV #2003 is about to curve south just south of the ends of the platforms at Union Station to get closer to the ocean. SD100 LRV #2003 continues curving as it goes onto the right of way that gets very near the ocean, blocking a grade crossing that has over five tracks (two for the light rail) three are tracks that are at the end of the Santa Fe Depot and probably only get service from an occasional freight train serving the seaport. 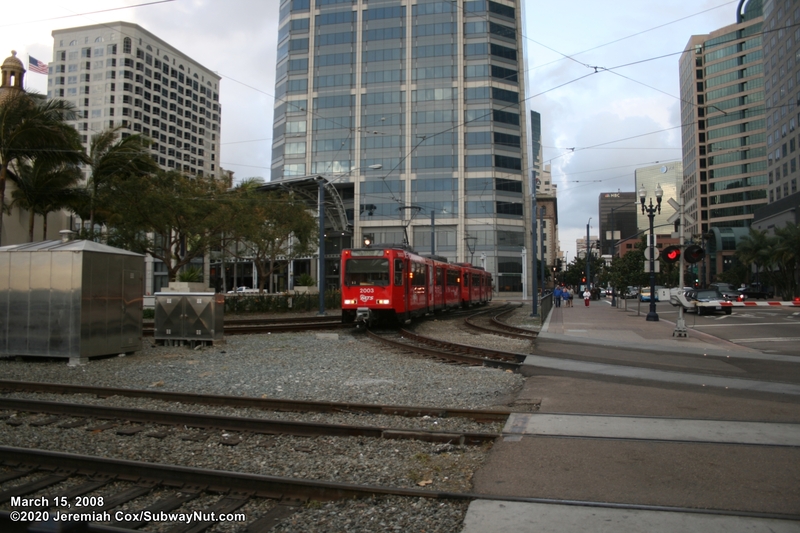 SD100 LRV #2003 has finished curving onto the right of way that will get it much closer to the ocean. 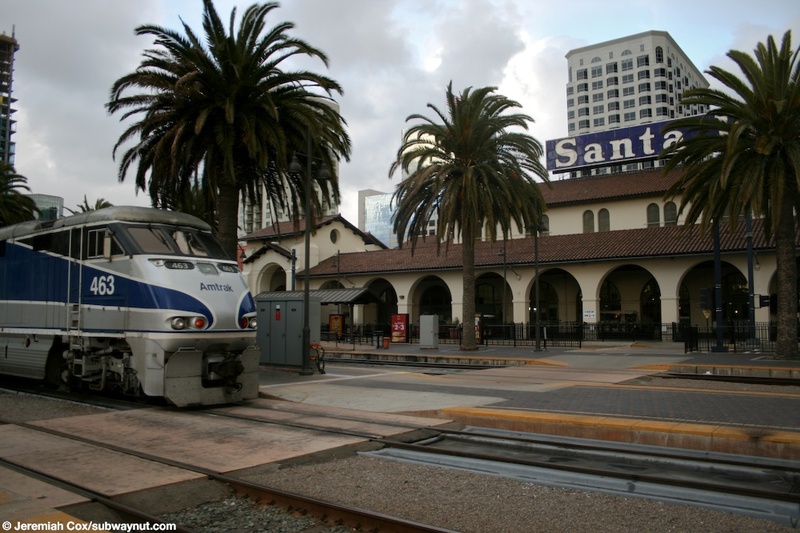 A side view of F59PHI locomotive and the Santa Fe Depot building. 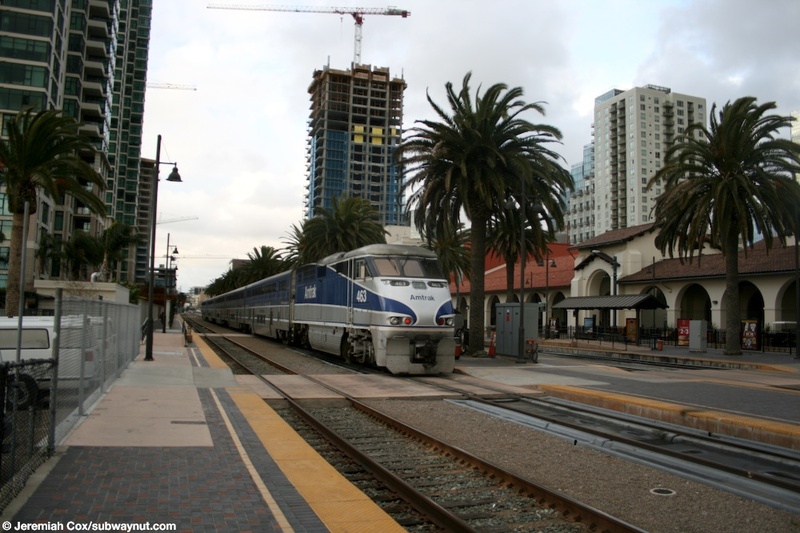 A new tower is being built behind F59PHI Locomotive #463 that is ready to push a Surfliner train up to Las Angeles. 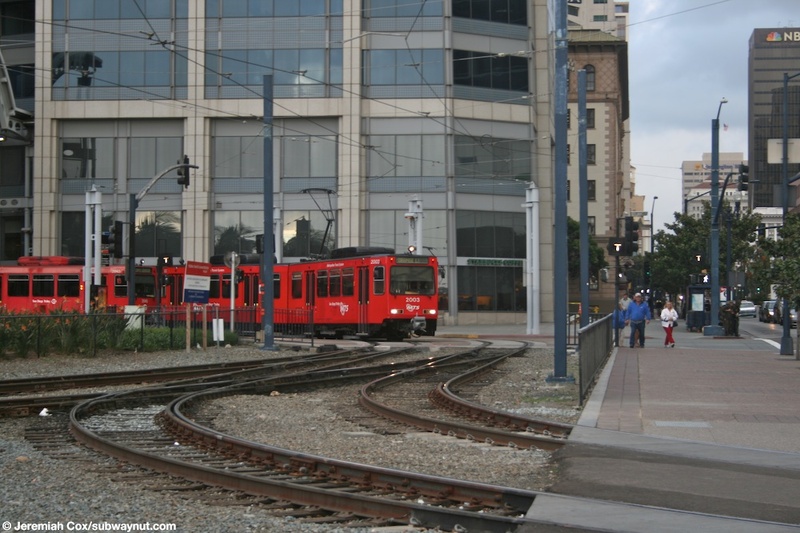 SD100 LRV #2038 pulls an orange line train just south of the Santa Fe Depot Station, even though it doesn't actually stop their. SD100 LRV #2038 leads a train just south of the Santa Fe Depot Station that curves north up to America Plaza Station, just missing the Depot Station. 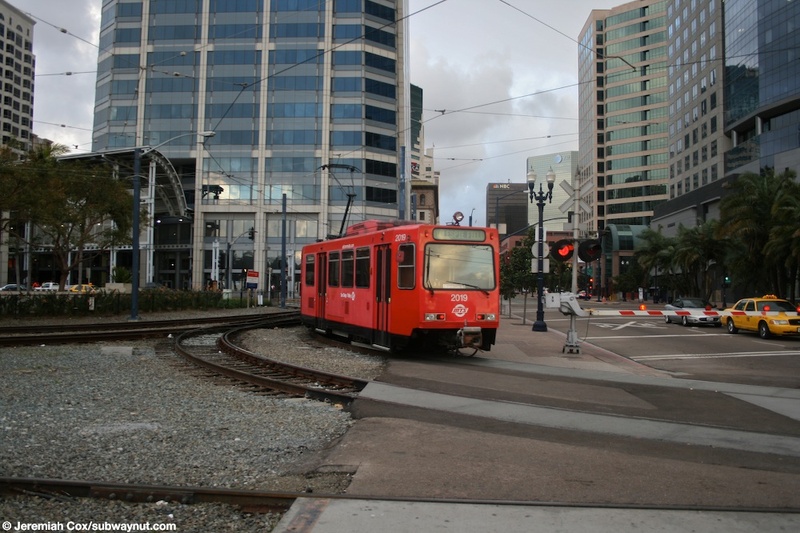 SD100 LRV #2019 continues as the last car of an Orange Line train barely misses stopping at the Santa Fe Depot Station and curves up to serve American Plaza instead. 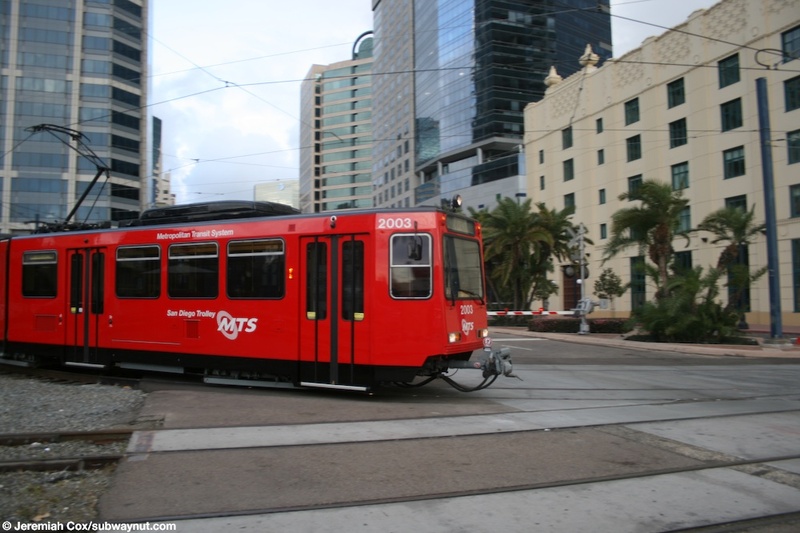 SD100 LRV #2019 continues curving off the light rail that serves the waterfront to enter it's more inland route through downtown. 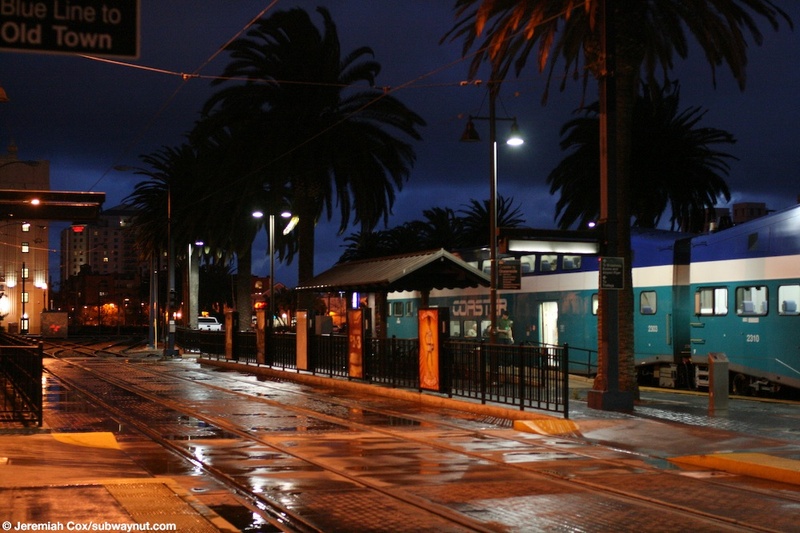 Looking down the Blue Line's Light Rail Tracks through the Santa Fe Depot Station. They separate the Amtrak and Coaster platforms from the Station building. 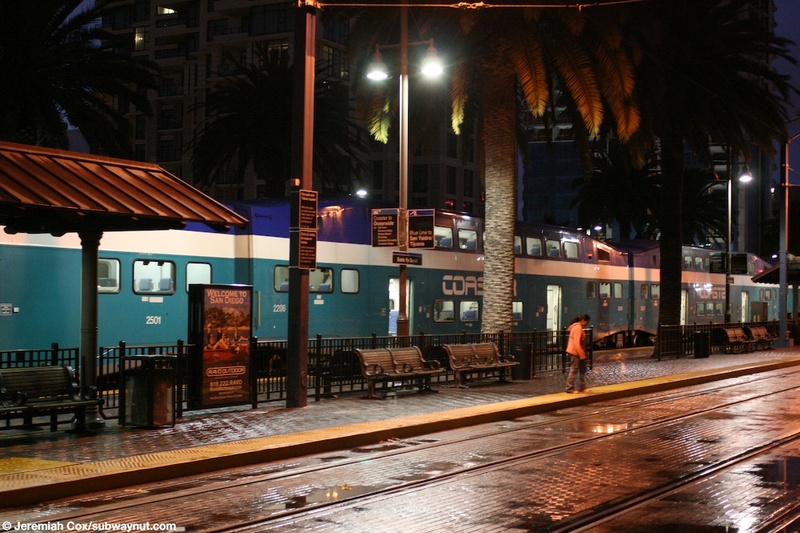 Looking from the Light Rail platform across to Bombardier Cab-Car #2303 and Coach #2310 that consist of part of four coach northbound Coaster train on a rainy Saturday night. Bombardier bi-level coaches #2501 & #2206 are two more of the coaches of a four car Coaster Train that waits to leave San Diego and make it's run up to Oceanside on a rainy Saturday night. 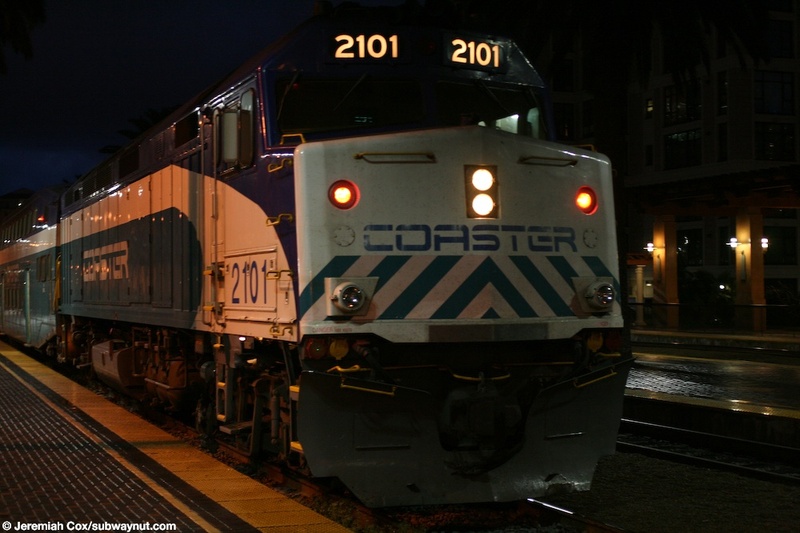 Coaster F40PH-2C Locomotive #2101 waits at San Diego (Santa Fe Depot) to lead a northbound train up to Oceanside on a wet Saturday night. 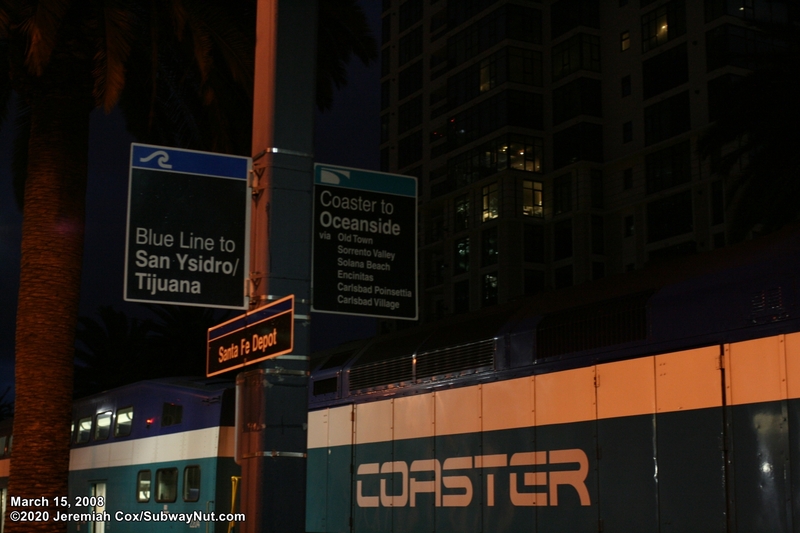 Signs for the Blue Line to San Ysidro/Tijuana and the Coaster to Oceanside, with the large Coaster text on a locomotive visible. 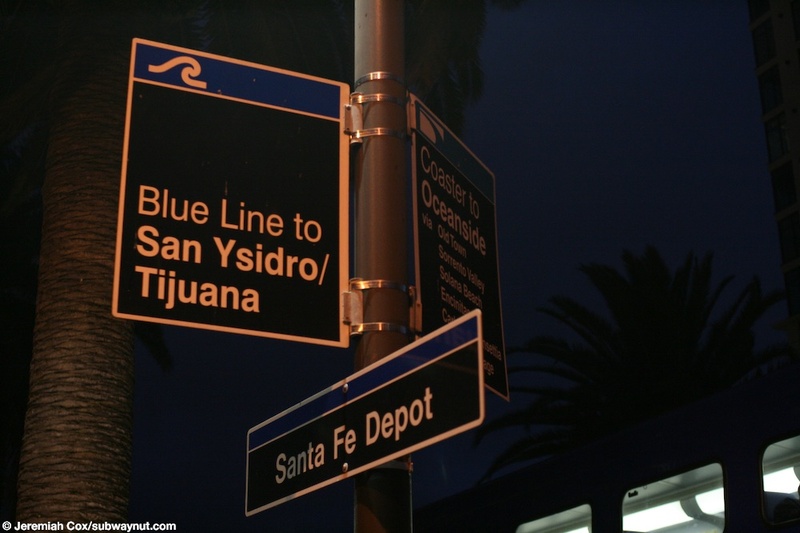 A close up of Light Rail Station sign on the destinations of Coaster and the Blue Line Trolley.